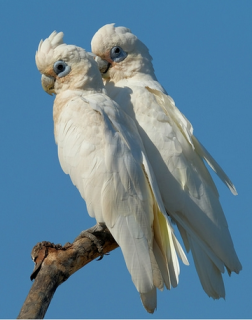 The population of the Little Corella is thought to be increasing instead of decreasing like so many other parrots. C.s. sanguinea: Both adults in general white; pink/orange lores and hidden bases of feathers of the head; dark grey/blue, bare eye ring, extending well below eye. Eye dark brown. C.s. normantoni: Both adults as in sanguinea but smaller in size. C.s. transfreta: Both adults as in normantoni, but underwings and undertail washed with yellow/brown. C.s. gymnopis: Both adults more pink/orange on lores and bases of head feathers, foreneck to upper breast and back of neck. C.s. westralensis: Both adults as in gymnopis, but with brighter orange/red on lores and colour more strongly washed through feather bases of head to upper breast and mantle, reaching to blend with lower underparts and thighs; underwings and undertail washed lightly with deep yellow. C.s. sanguinea: As in adult but with paler blue eye ring tinged grey/pink underneath eye. C.s. normantoni: As in adult. C.s. transfreta: As in adult. C.s. gymnopis: As in adult. C.s. westralensis: As in adult. Contact call repetitive and squeaky. A flock calling together sounds like distant geese. Rare; not exported from Australia, infrequently imported from New Guinea. Walk-in aviary, minimum length 3m (9.8 ft). Mix of small seeds: canary, oat, safflower, spray millet; limited sunflower, dry, soaked or sprouted; sprouted beans and pulses, cooked butterbeans and lentils, green leaves such as: Swiss chard, lettuce, sowthistle, dandelion, chickweed; vegetables such as: corn, carrot, celery, zucchini, squash, green beans and peas in the pod; fruit such as: apple, pear, orange, cactus fruits, bananas and others; nuts: walnuts, hazelnuts, pecans, roasted peanuts; complete kibble. Provide lots of bird-safe chew toys (wooden block and vegetable tanned leather) and branches (pine, fir, elder, willow) for them to strip the bark off. Nesting log a metre long and 35cm (13.6 in) internal diameter or vertical box 12" x 12" x 24" (30.5cm x 30.5cm x 61cm). No threats presently but still a protected species (except S Australia). May be shot as a pest on private land. C.s. sanguinea: N Australia, including larger offshore islands. C.s. normantoni: W Cape York Peninsula south to Gulf of Carpentaria, N Queensland. C.s. transfreta: S New Guinea between Kumbe and lower Fly Rivers. C.s. gymnopis: Interior of E Australia, north to E Cape York Peninsula, N Queensland and west to NW South Australia. Introduced to Tasmania, and feral populations near urban centres in Australia. C.s. westralensis: Coastal and inland C and W Australia, from Great Sandy Desert to Moora district and east to longitude 123 degrees. Feral population in Perth district includes gymnopis. Found in riverine woodland adjacent to grasslands or agricultural areas (breeding season). Outside the breeding season they may be found in a wide variety of areas including Eucalyptus/Acacia scrublands with short grass, open or lightly treed grasslands, ricefields, sedge plains, mulga, mallee, Callitris/Eucalyptus woodland, semiarid and monsoon woodland and shrubland, spinifex, saltbush Atriplex, mangrove, crop areas, roadsides and suburban areas. Seeds, paddy melons, nuts, fruits, berries, flowers, roots, corms, buds, shoots, insects, wood-boring larvae and blossoms. Occur in large flocks (up to 70,000 birds) at a time to search for food; roost near water and drink before moving off towards feeding areas, often a long distance away. Feeding times morning and afternoon. Birds are playful, rolling on their backs or hanging upside down from wires. Commonly found in the company of Galahs. Has been recorded in most months but in the north of Australia May-October, southeast August-December. Queensland December-April, July-October and February-May. Nesting said to be by climatic conditions, three months after end of wet season in the north.